"Defeat the Robot Masters with this new Mega Man Pop! vinyl figure, depicted leaping into action armed with his Mega Buster. No Mega Man collection is complete without the titular hero, also known by the alias Blue Bomber. Embodying courage, a passion for justice and restraint when dealing with his enemies, Mega Man is a credit to his creators, Dr. Light and Capcom, and is extremely unlikely to cause any brawls among your collection." 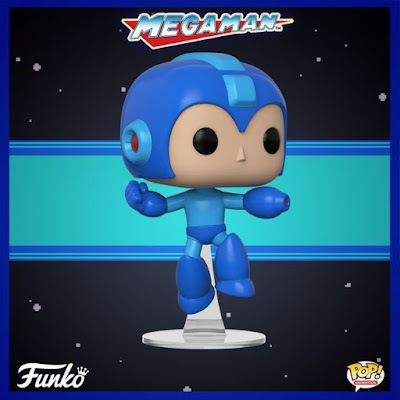 Not counting color variants, "Jumping Mega Man" is the forth figure in Funko's Mega Man sub line. Chances are it surely won't be the last. Grab yours here. Dear lord. Won't they stop! Somebody think of the children! But, I'm sure this has its audience. Otherwise, they wouldn't keep making the darn things! Oh God. It's so gross! Eh, it looks more like he's doing Gangnam Style more than he is jumping. Ah, but the dead-eyed stare continues. Also, PD, i believe you have a little typo at the end there with "forth." Wouldn't that make it the fifth, not the fourth (or forth as it is spelled here)?